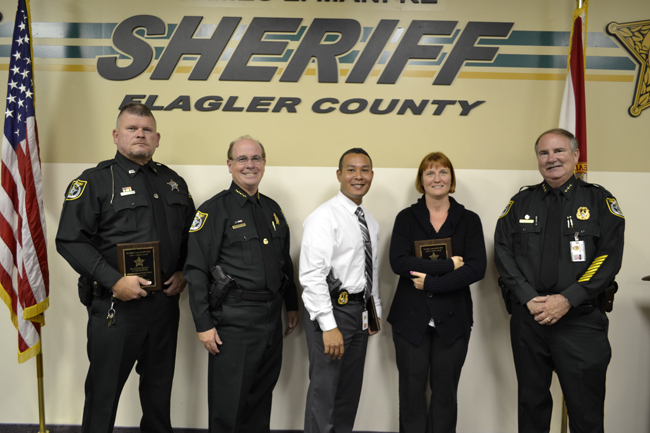 Unlike the Nobel committee, it looks like the Flagler County Sheriff’s Office knows a winner when it gets one: Communications Supervisor Genice Caccavale was one of three department employees to win Employee of the Quarter awards, Sheriff Jim Manfre announced this week. Also winning were Detective Mark Moy and Detention Deputy Randy Vickers. Caccavale’s training as a dispatcher, coupled with her calm, levelheaded response to the call until the arrival of paramedics was vital to saving the life of the child, Kelisa. She received the Employee of the Quarter award for the third quarter of 2013 during a ceremony at the Sheriff’s Operations Center. There was going to be no argument about Moy, either: Moy is the detective who broke the case of the murder of Zuheily Rosado, the store clerk at the Mobil station-convenience store on State Road 100 in Palm Coast who was gunned down, execution-style, on Feb. 21. The murder was one of the most heinous crimes to have taken place in Flagler County in many years, drawing extensive media coverage. In the early stages of the investigation, investigators turned to Crime Stoppers in hopes of developing leads. Moy, assisted by Cpl. Nate Koep, Det. Erick Kuleski and Det. Gabe Fuentes followed up on numerous leads. Eventually a lead provided through Crime Stoppers led them to a suspect in south Florida–and the arrest on Oct. 12 of Joseph Bova, who was indicted last week by a Grand Jury in connection with the case. In the Detention category, Detention Deputy Randy Vickers was recognized for his vast knowledge of detention services as demonstrated through his attitude, work ethic and interpersonal skills with inmates at the Flagler County jail. Vickers provides guidance to juvenile suspects in an effort to steer them towards making better decisions in their lives and on the importance of remaining in school and continuing with their education. Congrats to each of them. It isn’t often we see Staley smile. WOW! Isn’t Vickers the jailer that takes information to and from inmates feeding some information about inmates to select individuals? This is great, but are they not just doing what they get paid to do? I have never understood why the are a hero for doing their job.